SCOTTS VALLEY, CA and LAS VEGAS, NV--(Marketwire - January 5, 2011) - From the 2011 International Consumer Electronics Show (CES), The MediaTile® Company, a leader in cloud-based 3G and 4G digital signage solutions, today announced it is showcasing a breakthrough in virtual customer service solutions created in collaboration with the ng Connect Program and member companies, including Alcatel-Lucent. The Virtual Concierge and two other new solution concept demos in the ng Connect Program are showcased for the first time in the Alcatel-Lucent booth (Booth # 35469) at CES (January 6-9, 2011). The three solution concepts each show different aspects of retail, shopping and how interactive customer service will change thanks to high bandwidth networks, including 4G/LTE. Virtual Concierge, powered by the MediaCast System and 4G/LTE, enables consumers to now have a personalized way to communicate in a foreign land at an airport or hotel, or at a store or bank through an interactive kiosk where they can have a 2-way video conversation in the language of their choice. Travelers can also have the information shared by the expert pushed to their mobile device. Gametime Media Table, powered by the MediaCast System and 4G/LTE, is a connected media-playing tabletop where users can consume media, play games and share social networking apps, view advertisements and even interact using their own mobile phone as a controller or the touchscreen-enabled tabletop. Media Hotspot, powered by the MediaCast System and 4G/LTE, is a new digital age version of the jukebox that allows consumers to listen to their favorite artists, buy music, videos, movies and more, and then, if they like what they hear -- purchase the media on their mobile and take it with them. The Media Hotspot also includes a Wi-Fi hotspot. "Working with the ng Connect Program has been a rewarding experience. We've created an award-winning solution concept and we're proud of our accomplishment with the Virtual Concierge, which will truly change the way travelers and others can get information on new and exciting destinations," said Simon Wilson, CEO of The MediaTile Company. "Using MediaCast Video Presence running across 4G LTE networks, consumers can ask direct, face-to-face questions of subject matter experts and brand authorities 'in the cloud,' and pose these questions when and where it matters most -- from the aisle of a store, the lobby of a hotel, or the foyer of a bank. Now, consumers can get answers to their specific questions when they require immediate and accurate information." MediaTile is bringing solution concepts, including the Virtual Concierge, to market under the name "HumanKiosk with MediaCast Video Presence." The all-in-one system is a free-standing, interactive digital signage solution that delivers a breakthrough in brand-to-consumer communications. Using 4G/LTE high-bandwidth networking, the MediaCast system runs scheduled, interactive digital merchandising promotions while also providing a live, 2-way video session between a consumer in the store with a question, and a representative of that product or service. The MediaTile Company is actively engaging retailers, brands and others through pilot program offerings that commence in Q1 2011, with full delivery and deployments by year's end. Unlike customer-driven information delivery technologies and other forms of remote customer service, MediaCast Video Presence is highly engaging and personal. Customers will receive information that is contextually relevant to them, whether by demographic, location, or language. In addition, the HumanKiosk is fully self-contained, and requires no technology or network setup on-site; just add power and the system is ready to run. MediaCast® System -- Cloud Controlled. Our on-demand, 24x7 web-based content delivery and management system provides complete and secure control of your signage network enabling you to move your message™. MediaServices™ -- Cloud Created. Our media team and solutions deliver dynamic media and data, composer templates, and creative media services, enabling your digital signage network to be relevant™. MediaTile® Players/Displays/Kiosks -- Cloud Connected. Our media players, displays and HumanKiosk™ systems provide all-in-one capabilities, making setup extremely easy; just add power™. 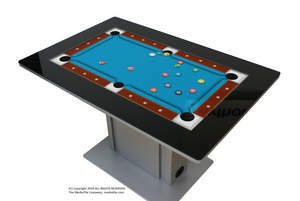 The ng Connect and MediaTile Gametime Media Table solution concept is powered by the MediaCast System and 4G LTE to deliver an interactive gaming experience allowing consumers to play games, share social networking applications, view advertisements and much more. The ng Connect and MediaTile Media Hotspot solution concept is powered by the MediaCast System and 4G LTE to deliver interactive digital promotions and on-demand music and video downloads for consumers equipped with smart phone devices. The MediaTile HumanKiosk, Virtual Concierge solution concept is powered by MediaCast Video Presence and 4G LTE to enable interactive digital promotions and on-demand, 2-way video sessions giving consumers instant access to off-site knowledge experts in a personal, face-to-face manner.